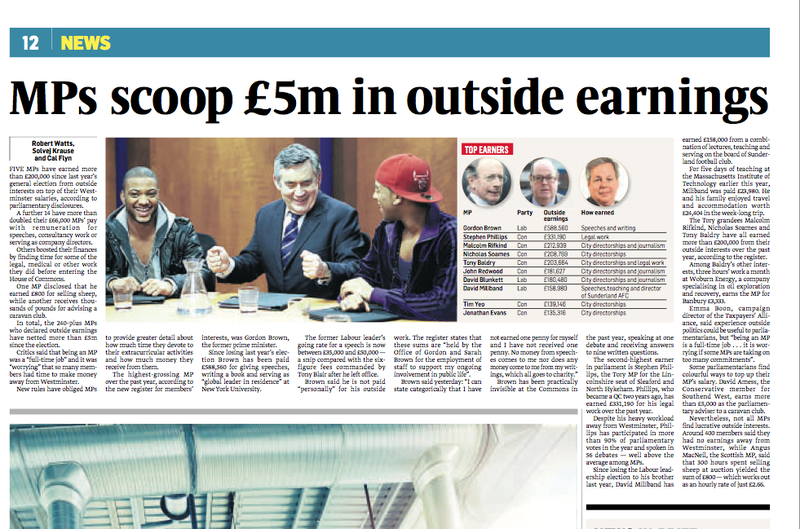 I worked on a Sunday Times team to analyse the parliamentary register of MPs financial interests. Former PM Gordon Brown topped the table, with £588,560 in declared earnings on top of his Westminster salary – but told us that he has donated every penny to charity. Not all MPs have such lucrative interests. Scottish MP Angus MacNeil earned £800 from 300 hours selling sheep at auction — an hourly rate of just £2.66. Full article on the Sunday Times website here, and after the fold.